Refractive surgery (corrective eye surgery) includes PRK, LASIK, and SMILE procedures, among others. Market Scope is a research firm that collects data on LASIK procedure rates, and seems to be the primary (if not the only) source for such data. I’ve found an 18-year dataset, 1996-2014 (the last two-years of which were forecast). I’ve contacted Market Scope to inquire if they have long-term forecasts as well. No US forecasts obtained yet. The best academic paper addressing refractive surgery forecasts (in China) suggests that procedure rates are fairly stable in the US. As of 2011, more than 11 million LASIK procedures had been performed in the United States. Dan Lindfield and Tom Poole. 2013 February. “Nd:YAG Treatment of Epithelial Ingrowth.” Cataract & Refractive Surgery Today Europe. Number of LASIK (laser-assisted in situ keratomileusis) surgeries in the United States from 1996 to 2014 (in 1,000s). In 2012 U.S. procedure volumes were approximately 700,000 procedures per year. The average price point of $1500 per eye in the United States factors to a total U.S. market size of $1.05 Billion / Year. The model for potential market growth is based on the observation that the laser refractive surgery market in the United States demonstrated saturation at approximately 2.7% penetration, and showed a baseline volume at approximately 1.2% penetration. In this context, market penetration is defined as annual procedure volume compared to the potential candidate pool. EQUATION 1: General estimate of United States candidate pool for laser refractive surgery. The result calculates to 28.3 million people. Guy Kezirian, et al. 2013. “Forecast of Laser Refractive Surgery in China: 2013-2023.” Northwestern University Kellogg School of Management. Pages i, iii, Figure 1. Dr. Kezirian (info@surgivision.net) is a board certified and sub-specialty trained ophthalmologist. His company has run several FDA studies for excimer laser approvals. He is an industry consultant in ophthalmology through his company, SurgiVision Consultants. Email inquiry sent 10/9 seeking recent figures and U.S. forecasts. Ron Krueger, MD, of the Cleveland Clinic in Cleveland, Ohio, discusses his forecast for the future of LASIK procedures. LASIK will probably be replaced by something else in the next 10 years due to flap complications, biomechanical concerns, dry eye concerns. SMILE procedure (or something like it) will probably replace it. Mark Kontos and Ron Krueger. 2014. “Will LASIK Still Be Kind in 2025?” Aspen 2014. American-European Congress of Ophthalmic Surgery. Eyetube.net. I think Dave Harmon and Bill Freeman of MarketScope are your best resources. Toric IOLs are extremely popular and perhaps the most widely used. The patient pays out of pocket and the surgeon is able to significantly reduce the amount of pre-op as well as post-op (surgically induced) astigmatism. We had hoped that having LASIK would become as anticipated as getting braces on your teeth. Unfortunately, this did not happen and some bad PR apparently resonated much more than we anticipated. I would suggest that you contact someone from the American Refractive Surgery Council. AECOS is an Advisor to this group which is made up of industry as well as refractive surgery physicians. I do know that Richard Lindstrom MD, Eric Donnenfeld MD and Kerry Solomon MD are all very actively involved in this organization and would be great to interview. Current injuries data is collected by two federal agencies, the Centers For Disease Control, and the Bureau for Labor Statistics. The CDCs data describes overall injury rates (fatal and nonfatal) going back to 2002. BLS’s data describes work-related injury and illness rates (fatal and nonfatal) going back to 1992 (only 2003 for nonfatal incidents). The Pardee Center for International Futures produces the most long-ranging forecasts for injury- and illness-related fatalities that I’ve found so far. (As far as I can tell, their forecasts do not included non-fatal incidents.) I’ve taken samples of their data from the top of the decade through 2050, but annual data are available from 2010 through 2100. Src: Barry B. Hughes, Randall Kuhn, Cecilia M. Peterson, et al. 2011. 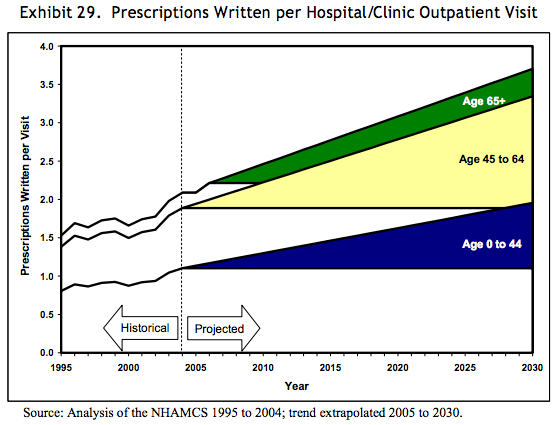 “Projections of global health outcomes from 2005 to 2060 using the International Futures integrated forecasting model.” Bulletin of the World Health Organization. I consulted a few different sources of information for illness statistics. The Bureau of Labor Statistics has a very small sample of sick-leave used data (for 2009). Gallup and Healthways also have a small sample of sick-leave data (for 2012). No forecasts are available. Several think tanks are tracking reported rates of chronic illness. A couple forecasts are available. Results are summarized below. In 2012, researchers from the Bureau of Labor Statistics conducted a one-time tabulation of sick leave provision and usage. The data used were compiled from the 2009 National Compensation Survey, looking only at full-time workers in private industry. The researchers averaged the amount of sick leave used in each of 6 industry areas (financial activities; information industry; trade, transportation, and utilities; professional and business services; leisure and hospitality; construction). In the first four of those industries, workers used an average of 4 days of sick leave per year. In the last two industries (leisure and hospitality, and construction), workers used an average of 2 days of sick leave per year. This was a one-time tabulation. Jason Ford says by email that he’s not aware of any forecasts. To his knowledge, additional years of this data are not available. Ross O. Barthold, Jason L. Ford. 2012 February 29. “Paid Sick Leave: Prevalence, Provision, and Usage among Full-Time Workers in Private Industry.” Bureau of Labor Statistics. 2012 survey data of workers in 14 job categories found that usage of sick days ranged from 6 days per year to 3 days per year. The survey was conducted by Gallup and Healthways as part of Healthways’ annual Well-Being Index report. The survey was administered to 94,000 Americans who work at least 30 hours per week. 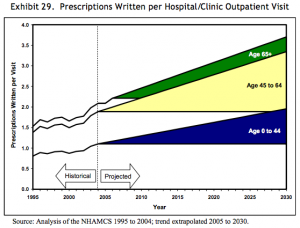 Note: 24/7 Wall St. performed the analysis of data collected by Gallup-Healthways. Emailed Healthways (9/25) to see if they’re still collecting this data. Michael B. Sauter, Samuel Weigley and Alexander E.M. Hess. 2013 May 9. “Workers Taking the Most Sick Days.” 24/7 Wall St.
Gallup and Healthways have compiled their Well-Being Index annually since 2008. It’s a “barometer of Americans’ perceptions of their well-being.” The index is compiled based on survey responses to questions about six areas of life: life evaluation, emotional health, work environment, physical health, healthy behavior, basic access. The Physical Health Index is comprised of questions related to: Body Mass Index, disease burden, sick days, physical pain, daily energy, history of disease, and daily health experiences. * Declining work environment scores. In 2008, The Milken Institute found that one third of Americans reported having at least one of seven common chronic diseases, with a total of 162.2 million cases in 2003. They forecasted a 42% increase in cases of those diseases by 2023, for a total of 230.7 million cases. Of the seven chronic diseases, pulmonary conditions were the most common, with 49.2 million cases recorded. Next in prevalence were hypertension, with 36.8 million recorded cases, and mental disorders, with 30.3 million; followed by heart disease at 19.2 million; diabetes at 13.7 million; cancer at 10.6 million; and stroke at 2.4 million. Ross DeVol, Armen Bedroussian. 2007. “An Unhealthy America: The Economic Burden of Chronic Disease.” Milken Institute. 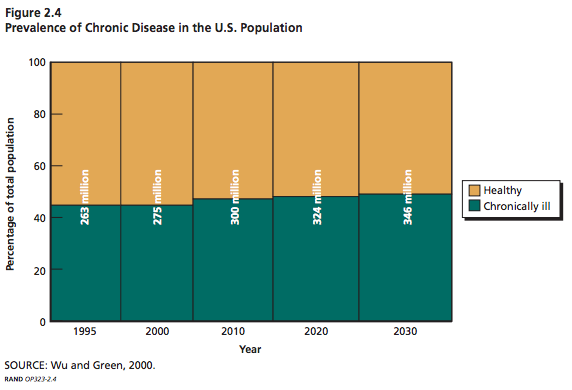 In 2009, almost half of Americans, 145 million people, had at least one chronic condition. This represented an increase of 10 million people over the estimate that was made in 2002 for the year 2009. The number of people with chronic conditions reached 125 million in 2000, forecast to reach 147 million by 2010 and 157 million by 2020. 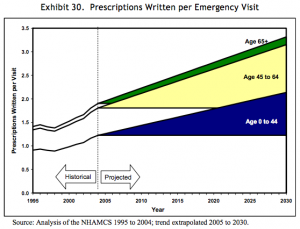 By 2030 half the population will have one or more chronic conditions. 2010. “Chronic Care: Making the Case for Ongoing Care.” Robert Wood Johnson Foundation. Soeren Mattke, Lisa Klautzer, Tewodaj Mengistu, et al. 2010. “Health and Well-Being in the Home.” RAND Corporation. The Marshall Protocol Knowledge Base. 2012. “Incidence and Prevalence of Chronic Disease.” Autoimmunity Research Foundation. The CDC tracks U.S. dietary supplement usage (which includes multivitamins and multiminerals) via its National Health and Nutrition Examination Survey (NHANES), which began in the 1970s. In 2011, the CDC said over half of U.S. adults were taking dietary supplements. Gahche J, Bailey R, Burt V, et al. 2011. 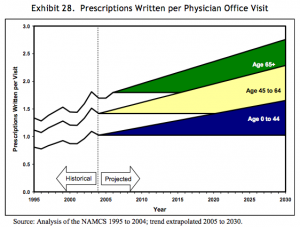 “Dietary Supplement Use Among U.S. Adults Has Increased Since NHANES III (1988–1994).” NCHS data brief, no 61. Hyattsville, MD: National Center for Health Statistics. Madison Park. 2011 April 13. “Half of Americans Use Supplements.” CNN. 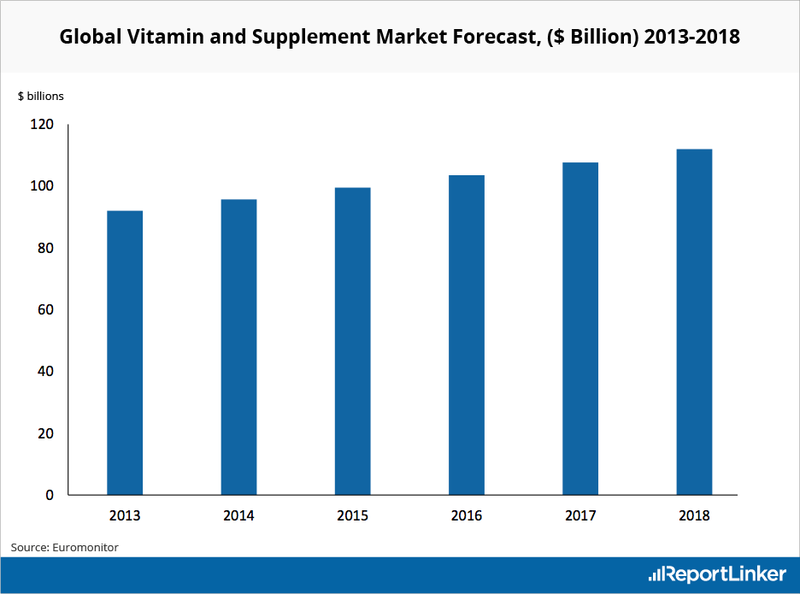 Euromonitor tracks the vitamins and dietary supplements (VDS) market. In 2013, they estimated that the market would grow at a CAGR of 4% between 2013 and 2018 to reach $112 billion in 2018. Statistics describing dental services and usage rates are collected as part of the previously cited Medical Expenditure Panel Survey (MEPS topics: Dental Visits/Use/Events and Expenditures). Unfortunately, the publications that summarize this data often do not include procedure-level details, but instead focus on dental expenditure on the whole as a percentage of health spending. The total number of procedures increased from about 496 million in 1996 to about 572 million in 2004. Diagnostic includes exams and x-rays. Preventative includes cleanings, flouride, sealants and recall visits. Restorative includes fillings and inlays. Prosthetic procedures include crowns, bridges, and dentures. Endodontic procedures include root canals. Other includes any other dental service not included above. Richard J. Manski and Erwin Brown. 2007. “Dental Use, Expenses, Private Dental Coverage, and Changes, 1996 and 2004.” Agency for Healthcare Research and Quality, Rockville, MD. Co-author Richard Manski (rmanski AT umaryland DOT edu) has written a couple of foreward-looking papers for RAND. I’ve emailed him to ask if he is aware of any ~10-year forecasts for dental braces usage. EDIT: Manski is unaware of any forecasts. Dental raw data from the on-going MEPS survey is available here: MEPSnet/HC Trend Query. Raw data for orthodontic visits in 2012 is here, for example: 2012 Full Year Person-Level File. DVGEN12 – # GENERAL DENTIST VISITS 12. Assistance in interpreting the data would be helpful.